Millard’s first book, “Bokotola,” telling about early years of the Fullers’ marriage, business success, giving away fortune to seek Christian service, starting partnership housing ministry at Koinonia Christian Community and Fullers’ work of successfully carrying the idea to the middle of Africa in 1973 on a plot of land called Bokotola. March: Fullers purchase a house from friend Rev. Jim Jackson for $2500 at 417 W. Church Street, Americus. Because the old wooden porch was falling down, it was replaced with a smaller brick porch, planters and steps. Linda took charge of minor repairs to the interior: replacing carpet, installing shelves for law books, purchased used office furniture and made curtains from bed sheets. June: The Fullers move 10 miles from Koinonia to Americus, Ga. Millard supports his family by practicing law. 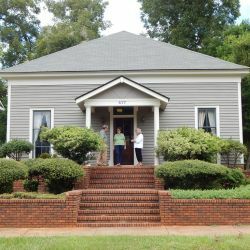 One room of Fuller’s law office was used for a part-time typist for HFH. Linda worked with Millard as law office receptionist, typist for legal documents, Habitat correspondence, newsletters, bookkeeper and photographer. Fuller children and volunteers stuffed, sealed and put stamps on newsletters. House building started in Zaire in 1974 continues to expand; citizens in San Antonio, Texas, form the first official U.S. Habitat affiliate. HFHI headquarters moves from Millard Fuller’s law office to a renovated house next door. Jim and Janette Prickett move from Indiana to Georgia to be administrator and bookkeeper. The First Habitat house in Americus is built. The First Habitat affiliate in Latin America — Guatemala — is approved. Love in the Mortar Joints, Millard’s second book, covering early development of Habitat for Humanity, is published. HFHI’s fifth year — a total of 14 U.S. affiliates and seven international affiliates, 342 Habitat houses completed. HFHI celebrates its seventh anniversary with a 700-mile walk led by Linda and Millard Fuller from Americus to Indianapolis. Hundreds come to Indianapolis from around the U.S. and overseas for a 3-day celebration. From the Walk, an extra $100,000 was raised to meet increasing budget needs.